There were six new coaches hired this offseason, and their new bosses have to be happy with what they've seen so far. Three of the six have guided their new teams into the top eight in their respective conference, led by Glen Gulutzan, who has the Stars first in the NHL with 22 points. The others are all within three points of a playoff spot. Considering all six teams that changed coaches missed the 2011 Stanley Cup Playoffs, the starts bode well for future performance. 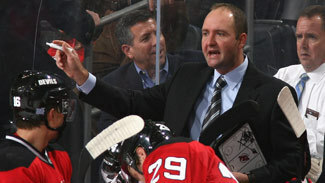 NHL.com takes a look at the six new coaches to see just how they are faring with the ups and downs of the first six weeks of the 2011-12 season. Peter DeBoer, New Jersey -- DeBoer had the biggest skates to fill in Hall of Fame member Jacques Lemaire, who stepped out of retirement to guide the Devils from the ruins of a 9-22-2 start to nearly make the playoffs before leaving again. Despite injuries to top goalie Martin Brodeur, top centers Travis Zajac and Jacob Josefson, and scoring star Ilya Kovalchuk, and with 18-year-old Adam Larsson the team's best defenseman, the Devils have won three straight and sit one point out of eighth place in the Eastern Conference. DeBoer's best move might have been the formation of a top line that features rookie Adam Henrique centering Zach Parise and Kovalchuk. The trio only played two games together before Kovalchuk got hurt, but showed flashes of brilliance. Henrique has been a wonderful discovery, with the rookie entering Friday's game with points in four straight and a goal in three in a row. Kevin Dineen, Florida -- One of the many new faces in South Florida has been the successful minor-league coach getting his first taste of life in the NHL. And so far, Dineen has managed to unite all the new pieces into a cohesive unit. The Panthers snapped a three-game losing streak with a 5-1 win against Toronto on Tuesday, and while they're seventh in the Eastern Conference, they're just one point behind Southeast Division-leading Washington. Not bad for a team that hasn't seen postseason play since 2000. Dineen's biggest impact has come on the power play, where the Panthers are fifth in the League at 22.6 percent, after finishing 30th in the League at 13.1 percent last season. He's also brought all those disparate parts together to create depth up and down the lineup. Of the 19 player to skate in at least six games for the Panthers, 16 have at least one goal. 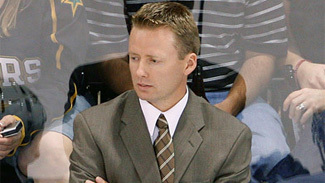 Glen Gulutzan, Dallas -- Gulutzan arrived in the NHL with probably the least name recognition of any of the six new coaches, but so far he's been the most successful. Dallas won six of its first seven games and hasn't looked back, and after Tuesday's 5-2 win in Washington, stood atop the League standings. The Stars have won four straight, including the first two on their current four-game road trip that takes them next to Pittsburgh and then to Detroit. "We're trying to gauge ourselves against the League and coming into Washington and then heading to Pittsburgh and Detroit, we feel this is going to be a real good measuring stick," Gulutzan told reporters. "Tonight, we liked our game and it just gives us confidence moving forward." It was assumed after the Stars missed the playoffs for the third straight season and watched top scorer Brad Richards leave as a free agent that they would be among the League's bottom dwellers. However, Jamie Benn and Loui Eriksson have filled the scoring void and veteran defenseman Sheldon Souray has been re-born after spending last season in the AHL. The true star, however, has been goalie Kari Lehtonen, who despite seeing a League-high 407 shots, is sixth with a .936 save percentage. Paul MacLean, Ottawa -- The long-time Red Wings assistant coach has brought all his smarts to the rebuilding Senators and has kept them in playoff contention through the early part of the season despite a rough start that saw them win just one of their first six games. A six-game win streak saw them rise as high as fourth in the conference, but their current three-game losing streak has coincided with the loss of captain Daniel Alfredsson to a concussion. However, the Senators are just one point out of a playoff spot after finishing 19 points out in 13th place last season. The biggest beneficiary to MacLean's hiring could be center Jason Spezza, who is scoring at a point-per-game clip and is on pace for his best offensive season since 2007-08, when he had a career-best 92 points. He's also winning 56.4 percent of his faceoffs, a big improvement on his career 52.4-percent winning percentage. The Senators' power play also has risen with MacLean on board, going from 17.5 percent last season to 25.5 percent this season, third-best in the League. Claude Noel, Winnipeg -- Noel had 24 games of coaching experience in 2009-10 when he replaced the fired Ken Hitchcock, but said this experience has been far different for him. "It's a lot easier when you start from the beginning," Noel said recently. "First of all you get to plant the things you want right from training camp and work through it. … The process has been good for me. Starting from the beginning is a lot easier." "It's a lot easier when you start from the beginning. First of all you get to plant the things you want right from training camp and work through it. … The process has been good for me. Starting from the beginning is a lot easier." The Jets have taken some of the same struggles they had in Atlanta last season, including winning consecutive games just once so far. Despite that, they're just three points behind eighth-place Tampa Bay in the Eastern Conference. One of the big factors in Winnipeg's success has been the development of second-year forward Alexander Burmistrov, who is tied for second on the team with 10 points through 15 games after he had just 20 points in 74 games last season. Noel also has given Burmistrov quality time on the power play, where he has a goal and an assist. Mike Yeo, Minnesota -- After serving as a long-time assistant with the Pittsburgh Penguins -- including helping the team win the Stanley Cup in 2009 -- Yeo spent his first season as a head coach guiding the Wild's AHL team in Houston to the Calder Cup Final. Now he's turning the Wild into winners. The current five-game win streak has rocketed Minnesota to fourth in the Western Conference, one point behind Northwest Division-leading Edmonton. Guillaume Latendresse and Dany Heatley have three goals each in the run, but the real key has been in net, where Niklas Backstrom and Josh Harding have combined to allow just three goals in the five games. Harding won four straight and was named NHL First Star of the Week, and Backstrom returned with a shutout of the Flames on Tuesday. The Wild are second in the League in allowing just 1.79 goals per game, and their 84.6 percent success rate is an improvement over the 82.8 percent from last season.